Well, have you noticed how included the topic of this article on this phrase? 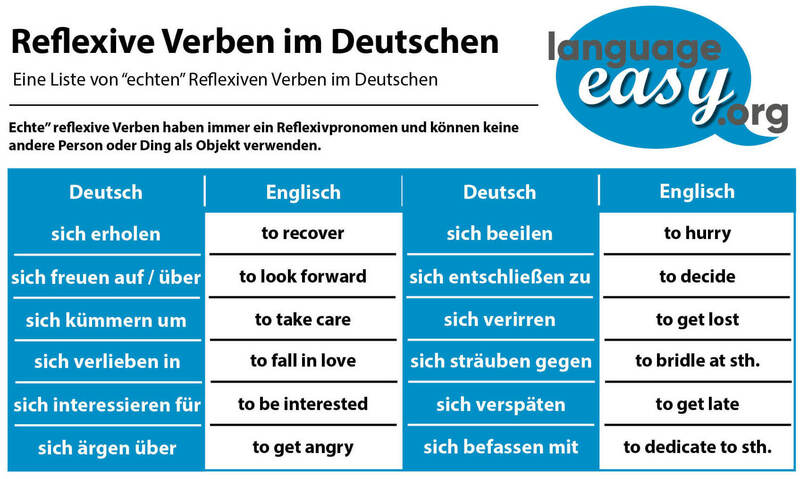 Exactly, today we will talk about German reflexive verbs. Hopefully, you’ve had a good day so far – this topic can be a bit complicated and, unfortunately, need a lot of studying afterwards. Nevertheless, you will see that German reflexive verbs are an essential part of German grammar. Apart from their importance in the context of dative and accusative, they are the only way you can talk about yourself. Furthermore, German reflexive verbs are used much more frequently in German than they are in English. But don’t worry, in the following, we will have a detailed look at their right way to use these verbs. Additionally, we will talk about reflexive pronouns, as they are connected with these verbs. By the way, there is a good article on Wikipedia about German reflexive pronouns. Just click on it and you will be redirected to some more background information. Now, let’s go straight ahead an talk about the importance of German reflexive verbs. Well, viel Spaß! First of all, we should clear up what we are actually talking about. 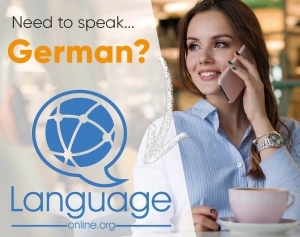 Well, in the following, you will see a first definition of this kind of verb and later on, we will have a look at the correct usage of German reflexive verbs. So, German reflexive verbs are verbs, that take a reflexive pronoun. Normally, their a preceded by the reflexive pronoun “sich“. Of course, we use reflexive verbs in German when the subject and object of a verb are the same. Now, as we have defined these verbs, we will try to learn some more about the correct conjugation and, of course, their usage. Especially, when talking German accusative reflexive pronouns and dative reflexive pronouns. So, as already mentioned, German reflexive verbs are used when the subject and the object of a sentence are the same. Well, here is a short example for what I mean. “Ich ziehe mir einen Mantel an.” – I put on a coat. Please, keep in mind that reflexive verbs are extremely common in German. So, in many cases, they are not translated into English, although they are reflexive verbs. By the way, whereas in the English language, reflexive verbs are used to emphasized that someone has done something for themselves, in German you use the word “selbst“. On the one hand side, there are verbs which are always reflexive. So, you always have to use them with a German reflexive pronoun. By the way, in the infinitive they are written with “sich”, as you might have read above already. On the other hand side, there are verbs which only become reflexive in case someone does an action for him -or herself. Of course, you have to use an object pronoun if the subject and the object are not the same. Furthermore, you really have to be careful with these verbs. So, in some cases, their meaning changes completely in case you add a reflexive pronoun, so they become a German reflexive verb. In the following, you will see some examples. Verlassen Reflexive: Ich verlasse mich auf dich. Non Relfexive: Ich verlasse mein Haus. Reflexive: I trust in you. Non Reflexive: I leave my house. Aufhalten Reflexive: Ich halte mich im Haus auf. Non Reflexive: Ich halte den Verkehr auf. Reflexive: I stay in my house. Non Reflexive: I hider the traffic. Ausziehen Reflexive: Der Mann zieht sich aus. Non Reflexive: Ich ziehe aus meiner Wohnung aus. Reflexive: The man takes off his clothes. Non Reflexive: I move out from my flat. Unfortunately, there are no real rules which determine whether a German verb is reflexive or not. So, there is only one thing you can do about that: Study, study and study even more! Well, on of the best ways to learn verbs is using verb lists. Of course, you can see immediately if it is a German reflexive verb or not by the word “selbst”. Luckily, there are many lists structured by vocabulary from level A1 to C2. So, just choose the adequate level. So, as already mentioned before, you need a reflexive pronoun to conjugate a German reflexive verb. Well, this pronoun can be in the accusative or in the dative case. By the way, in case you want to know more about reflexive pronouns, just click on this article on language-easy.org! Anyways, let’s have a look at the dative reflexive pronouns. Well, we should illustrate these German reflexive verbs with the dative case with some examples. So, please, have a look at the following list of the most common reflexive verbs with dative in German. Now, without losing too much time, let’s have a look at the accusative reflexive pronouns in the following table. Of course, you will notice that the pronouns are not to different from the dative ones, only the first and second person singular change. Of course, there we will illustrate this table by some examples. So, have a look at the most important German reflexive verbs with accusative. Well, I think it is not too difficult to understand how to form German reflexive verbs by using the right accusative or dative pronoun. So, the key is – again – to study hard the corresponding vocabulary lists. In the following, we will have a look at German reflexive word conjugated in different tenses and the word order they are put in. In the following, we will have a short look at the conjugation of German reflexive words in different tenses. So, we only have have a look at the first person singular forms. Perfekt Ich habe mich gebadet. Plusquamperfekt Ich hatte mich gebadet. Futur 1 Ich werde mich baden. Futur 2 Ich werde mich gebadet haben. Of course, there is also a special word order in the context of German reflexive pronouns. So, the placement of a reflexive pronoun in a sentence differs depending on the kind of clause and whether the object of the verb is pronouns. Hopefully, the rules below will help you put the reflexive pronoun in the right place every time. Well, in a main clause, the reflexive pronoun comes directly after the main verb. Furthermore, in a dependent clause, the reflexive pronoun comes after the subject and the conjugated verb comes at the end of the clause. Hopefully, you have learned some new things about German reflexive verbs. So, especially about their different forms and, of course, the correct way to use them. Unfortunately, your only way to master this topic, you will have study verb lists. Well, that’s something typical of German – you simply have to study, study, study. But try to think in possibilities German opens you: The country, the people and their culture. Auf Wiedersehen!